This Archetype PA rendering depicts a proposed redevelopment of Portland's Fishermen's and Widgery Wharves, featuring a hotel, parking garage and restaurants. A hotel will no longer be included in a developer’s plan for one of Portland’s wharfs, the city manager announced Friday. The news that developer David Bateman of Fishermen’s Wharf Portland LLC is dropping its pursuit of a hotel comes as the city grapples with concerns by fishermen over the future of Portland’s working waterfront. “After many discussions with the Bateman family, I’d like to thank them for taking this important step, as we did not think a hotel use on the waterfront side of Commercial Street was compatible with our working waterfront,” said City Manager Jon Jennings in a statement. A group led by local fishermen has argued non-marine development on and around the city’s piers has squeezed out the working waterfront, limiting space and obstructing business for uses like commercial fishing. The group began collecting signatures in support of a referendum that would seek to reinstate a requirement that all new projects in the waterfront zone be water-dependent, a rule that would effectively block hotels, restaurants and offices, the likes of which have proliferated in the area in recent decades. In response, the city has implemented a six-month moratorium on waterfront development to convene a committee to find ways to alleviate those concerns. 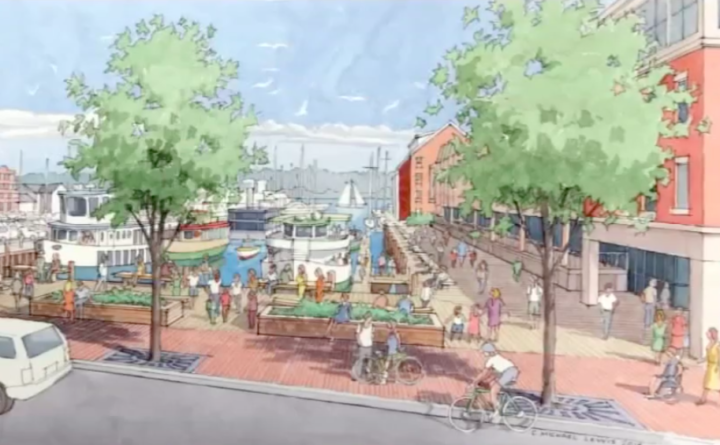 Bateman’s Fishermen’s Wharf Portland LLC has a conditional zoning application before the city’s Planning Board for 184 Commercial St., where the developer had originally proposed a mixed-use project including a 93-room hotel as well as parking, retail and restaurant space. A spokesman for the development group said Friday it’s “too early to say what a redesign will look like” without the hotel included in the project. “[Nathan and David Bateman] just spent several months designing new working waterfront features into their project, but events conspired to deny them the chance to present those ideas — to anybody. So it’s time to regroup,” spokesman Mark Robinson said, in a statement.